Faults in street lighting should be reported to Clarence by phoning 0800 23 23 23, or by filling in the online form. If appropriate, do not refer to "The Vennel" but instead to "Vennel". The light immediately above the door to No. 4 is classed as a street light. For stair lighting faults phone (0131) 529 5757. Can everyone remember that noise in a common stair travels easily and can disturb residents. Please, for example, close flat doors gently preferably with the key. This particularly applies where flat doors are close to each other.Think of your neighbours – and help them think about you, when you want peace and quiet. If you are affected by noise from a neighbouring flat, then please first approach those involved: they may not realise there is a problem. Telephone the Council's Noise Team (0131) 313 3131 if levels continue to be unacceptable. 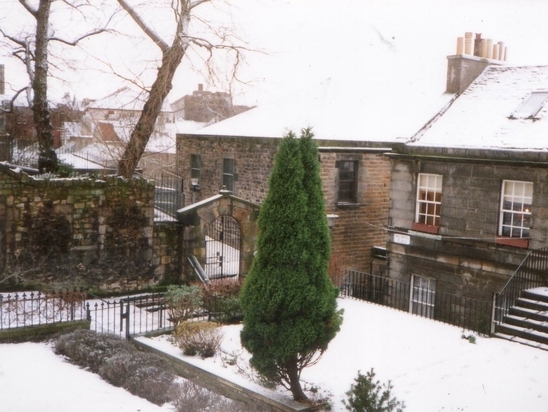 For noise in the Vennel, ring the Council's Noise Team on (0131) 313 3131. If you are planning a party please warn (or even better, invite!) the neighbours in good time. Try to ensure that any loud music or other disturbance does not go on after 11pm. To discourage public entry, please remember to close the garden gates. Anyone in No. 4 can use any of the lines in the back garden. All others can use the lines in the front garden. Communal areas should be kept clear (unless agreed by all) and clean: duties to be shared between flats and occupiers. Brush and mop your particular stair-case when needed. From time to time, unfortunately, graffiti appears on the Vennel. If you notice any, please inform Services for Communities on (0131) 529 3030, as soon as you can. The more promptly it is dealt with, the easier it is to remove. The Council will treat graffiti on the nursery, which is their property - if it is on private property it is the responsibility of the owner. For more information on treatment options and possible charges, contact Services for Communities. We no longer have a black bag collection. Please leave rubbish in well-secured bags inside any one of the large rubbish bins in Keir Street, up the steps. These are frequently emptied, and you may deposit rubbish in them at any time, on any day of the week. Please do not place rubbish bags in communal stairways or outside the properties. Special collections of bulky items—or those such as fridges, which require special disposal—can be arranged by the Council. These are provided for each household at a minimum cost of £19.99 for a collection of up to 6 items. Different charges apply to building and garden waste. You can now pay for collections over the phone using a debit or credit card. To make a booking, telephone (0131) 529 3030, or fill in the online form. There are paper and packaging recycling bins next to the rubbish bins in Keir Street. 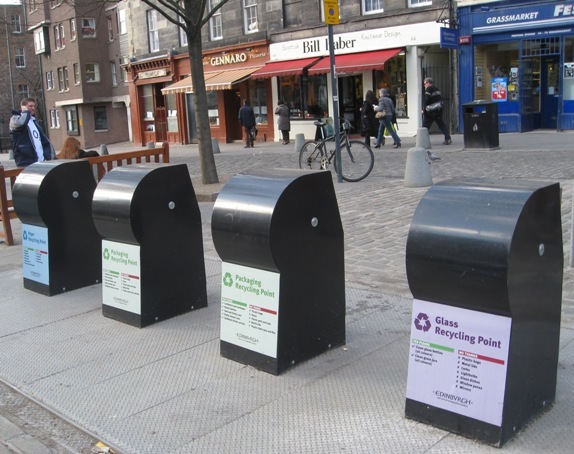 There are also three sets of below-the-surface recycling points in the Grassmarket, where you can take glass bottles and jars as well as paper and packaging. There is a bin for fabrics, clothing and shoes at Marshall Street, at the side of the new Dugald Stewart Building in Charles Street. To report large accumulations of litter and dumped rubbish on public land (such as the Vennel Steps) contact the Rapid response Team on 0808 100 3366.